Natural stone is one of the best choices of material for constructing any hardscape in Harrisburg, PA. Our stone supply can offer inspiration for your next patio or walkway project. The beauty of limestone or sandstone could make the next hardscape on your job list look naturally beautiful! Creating an aesthetically pleasing and durable landscape is the ultimate aim of any landscape contractor or designer. This makes choosing the right landscape lighting the essential final touch for your landscaping project in State College, PA. The outdoor elements that surround a residential property are typically divided into two categories: softscapes and hardscapes. Softscapes are the natural elements that spring from the ground, such as grass, trees, flowers, bushes and gardens. Hardscapes consist of all the man–made elements that facilitate human activity, such as walkways, decks, patios, fences, lights, pavilions and fountains. With the proper balance of hardscaped and softscaped elements, a residence can be just as beautiful and comforting on the outside as it is on the inside. Some houses come with well–developed hardscaping, while others could use work in terms of the organization and balance of walkways, seating areas and visual fixtures. 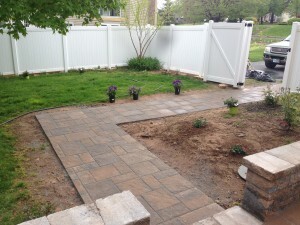 As with all types of home improvement, however, hardscaping involves foresight, planning and a significant investment of resources, time and labor. Before you decide upon a hardscaping project, consider both the practical factors, such as how the structure in question might impact the livability of your outer space, and the visual factors, like the finishes and design of your outdoor space. Privacy and security: The privacy that you could gain from adding a fence or replacing any preexisting fencing could come in very useful if you have a hot tub or pool installed in your backyard. Likewise, fences can also serve as boundaries, such as when the play area and garden need to be separated for practical reasons. If you have children or pets in the house, yet also maintain a garden in the backyard, a fence could allow for a playing area while keeping the crops safe from stomping feet or digging canines. Land evenness: On some properties, topographical unevenness is an issue that must be solved for practicality and safety reasons. If there's a sharp slope in your backyard or along the sides of your house, a retaining wall could be erected to prevent soil from sliding down and causing damage in the process. There are different types of retaining walls available, including concrete, gravity and anchor–based walls. Soil slopes, however, can still be a threat if there's no proper drainage because, unlike flat ground, slopes prevent water from sinking straight into the soil. Therefore, a retaining wall must be equipped with a draining mechanism to reduce the risk of a collapse at some point in the future. Shelter: Roof–equipped forms of hardscaping can serve as outdoor shelters, which come in handy during certain weather spells. A gazebo, for example, is a convenient place to go if drizzle starts during a backyard cookout party. Likewise, a tree house could function as a safe haven on hot days when sun rays cover the patio. Reduced lawn maintenance: With increased hardscaping, there's less greenery along the outer space of a house that needs to be maintained. If you consider tasks such as lawn mowing and bush trimming to be burdensome rather than joyous, an increased amount of gravel, structures and fences could make your home a lot more manageable. If your outer space is small to begin with, the addition of a patio or rocky path could reduce the spread of your lawn to a size that might only take minutes to mow on a weekly basis during summer months. For utmost unity, a hardscaped design scheme can reflect not just the interior colors and structural elements of a house, but also the style and textures of the indoor furnishings. Outward view correlation: The continuity principle can even be extended to the natural view beyond your property. If you live on the crest of a panoramic view of mountains, hilltops or ocean water, you might consider correlating some of the hardscape elements to the sights that lie within view of your windows and deck. For example, if a mountaintop can be seen far off beyond the valleys and hills behind your house, consider utilizing white and grey stone along the curved walkway that leads outward from your backdoor. Patios — Unlike wood, concrete pavers don't need finishing and aren't subject to mold or deterioration over time. Also, they are not subject to cracking like poured concrete. 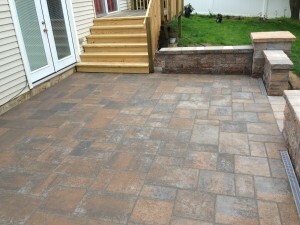 Many finish styles and colors allow for a truly custom patio that will last for the lifetime of the house. Walkways — Whereas stone can be more costly, brick can be uneven and gravel can feel loose and awkward, concrete pavers provide solid, even surfaces under the feet. Pool decks — Concrete pavers are a great option for pool decks. They are salt resistant, slip resistant, and chlorine will not affect their colors. Around pools, the joints will take on moisture and leave the pavement cooler underfoot. Decks — Concrete might be stronger, but the spaces between wood bars allow for rain to drain through to the ground underneath, which is vital not only to the state of a patio, but to the sanitation of an out space. Gazebos — A common feature of old country estates, the typically octagonal, pavilion structure of a gazebo is best constructed with wood. Tree houses — Likewise, wood works best for tree houses, which in a sense serve as man–made outgrowths of wood's primary source, the tree trunk. Fences — Yes, the age–old residential necessity is best constructed with the use of wood, whether you opt for a traditional picket fence or something taller, more secure and modern looking. Sandstone — With a range of hues that includes canyon orange, sandy gray and beige, sandstone offers a look that can range from neutral to sedimentary. Limestone — Salty in tone and sandy in texture, limestone can be used for a gravel base to paths and trimmings. As a bonus, the limestone will help neutralize your soil if you live in an area where the rain is acidic. Flagstone — Perhaps the most popular of all hardscape stones, flagstone is usually applied in panels of various size and shape over paths of grout. Quartzite — A light colored stone with a smooth texture, quartzite is ideal for sleek tiles and trimmings. Slate — Much darker than other stone types, slate has a sedimentary appearance that looks especially well in hardscapes with a deep gray or charcoal theme. 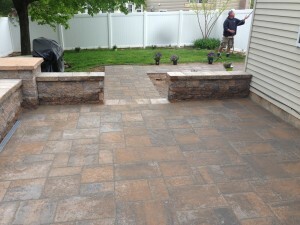 In today's hardscapes, another option is synthetic pavers. Though lacking the natural qualities of wood or stone, pavers can be colored and textured to approximate the look of various materials, including brick and flagstone. On properties, both large and small, hardscaping is a major undertaking. Whether you opt to do the work yourself or hire a contractor, it is essential that each project be handled with the proper tools and parts. For home improvement projects both in and around Harrisburg, PA, come to Watson Supply for all of your hardscaping supply needs.